This is a photo taken in 1884 of Todd’s 3x great grandparents, Edward Perkins & Sarah Huffman, and many of their children and grandchildren. What you see above is a photo I took of a *photocopy* of the photo. The photocopy was marked in pencil identifying some of the people. I took a photo, then erased the lines and took the photo above. Starting at the ground level on the left, there’s Edward & Sarah Huffman Perkins. Standing behind them is Adam Huffman Perkins. (He was married and had 6 children ages 11-4). Standing on the porch between the first two pillars is Mary Elizabeth Perkins Lockridge. (She was married and had 5 children ages 21-3. 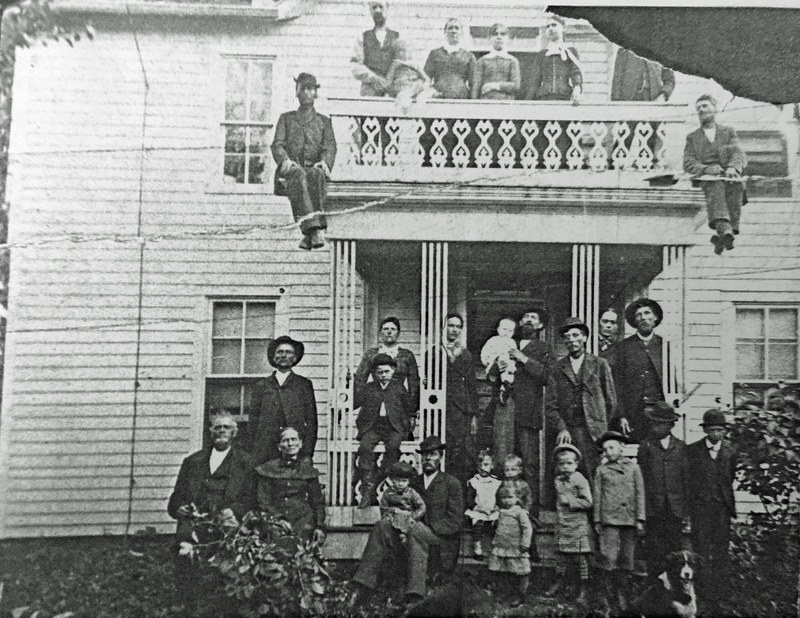 The man standing on the balcony at the far left is marked as Joseph, and may be her husband Joseph Lockridge.) The man seated holding a child is Benjamin Franklin Perkins. (He was not yet married, and had no children.) Next, the couple standing in front of the middle pillars is Elzira Perkins Gray and her husband Thomas S. Gray. (They had 3 children ages 6-1.) The man in front of the pillar isn’t marked, but I wonder if it’s their son Thomas J. Perkins, their only living child not indicated to be in the photo. He was married and had 4 children ages 11-2). Next to him, mostly hidden, standing to the right of the pillar is Rebecca Perkins Wiedmer. (She was not yet married and had no children). Next to her is Martin VanBuren Perkins. (He was widowed and had 2 children ages 9 & 3). Edward & Sarah had lost two children prior to this photo: Daniel R. died in the Civil War, and Elvira had died in 1877. Edward Perkins was born April 3, 1822 in Franklin, Illinois. His father is Daniel Reece Perkins and you can see his Find A Grave memorial here. His mother was Rachel Herring. Read about them here. Sarah Huffman was born on January 4, 1819 in West Virginia. Her parents are unknown. On the 1830 US Census, Edward was in Tazewell, Illinois with his parents and siblings, and on the 1840 US Census he was in Warren County, Illinois, with his parents and siblings. Later that year, Edward and Sarah married on August 27, 1840 in Warren County, Illinois. On the 1850 US Census, Edward was 28 and Sarah was 30. They had moved to Iowa, which was confusing at first because they went from Warren County, Illinois to Warren County, Iowa. They were farming. They had 4 children: Mary, age 9; Daniel, age 7; Martin, age 5; and Adam, age 2. On the 1860 US Census, Edward was 38 and Sarah was 41, and they were still farming in Warren County, Iowa. There were 9 children in the home: Mary, 18; Daniel, 17; Martin, 14; Adam, 12; Thomas, 10; Rebecca, 8; Elvira, 5; Elzira, 5; Benjamin, 2. On the 1870 US Census, Edward was 48 and Sarah was 51 and they continued to farm in Warren County, Iowa. Six children were at home: Adam, 22; Thomas, 20; Rebecca, 18; Elvira, 15; Elzira, 15; Benjamin, 11. Son Daniel had died in the Civil War. Mary and Martin were married. On the 1880 US Census, Edward was 58 and Sarah was 60. Three children remained at home: Rebecca, age 28; Benjamin, age 21; and an adopted son Frankie, age 6. I can’t find further information on Frankie. Their daughter Elvira had died. The photo above was taken in 1884. Sarah died on March 17, 1891 in Warren County, Iowa. Her Find A Grave memorial is here. Edward died on February 19, 1897 in Warren County, Iowa. His Find A Grave memorial is here. Mary Elizabeth Perkins – Mary was born on August 16, 1841. She married Joseph Hall Lockridge on June 23, 1861 in Warren County, Iowa. (Her brother Adam would eventually marry Joseph’s sister Mary Jane.) Mary and Joseph farmed and had 5 children. Mary died on February 12, 1906. Her Find A Grave memorial is here. Daniel R. Perkins – Daniel was born in 1843. He enlisted in Iowa to serve in the Civil War on August 19, 1862, when he was 19 years old. He died in that war. Martin VanBuren Perkins – Martin is Todd’s great great grandfather. Read about him here. Adam Huffman Perkins – Adam was born on March 23, 1848. He married Mary Jane Lockridge on June 9, 1872 in Warren County, Iowa. (His sister Mary married Mary Jane’s brother Joseph.) Adam and Mary Jane had 8 children, and were farmers. He died April 26, 1922 in Warren County, Iowa. His Find A Grave memorial is here. Thomas J. Perkins – Thomas was born in 1850. He married Sophia Jane Burkhead on December 31, 1874 in Warren County, Iowa. They had 9 children. He died on February 8, 1891 in Warren County. His Find A Grave memorial is here. Rebecca Jane Perkins – Rebecca was born on August 6, 1852 in Prole, Iowa. She married Absalom D. Weidner on April 1, 1883 in Warren County, Iowa. They had 4 children. She died on December 9, 1938 in Sedan, Kansas. Her Find A Grave memorial is here. Elvira & Elzira Perkins – They were born on October 27, 1855. Elvira married Thomas Smith Gray on July 3, 1875 in Warren, Iowa. She died on March 29, 1877. Her Find A Grave memorial is here. (There’s a child named Bertha C. Gray, who was born and died in 1870, said to be the daughter of Elvira and Thomas. However, both parents would have been 15 and the birth of the child was 5 years before their marriage, so I doubt this information. Also, to further confuse things, there is another Elvira Perkins, who was born the same year and married in Warren County, Iowa. Her father was Isaac O. Perkins and her mother was Margaret Dyer. I don’t know if they are related. Edward has a brother named Isaac but this isn’t him. This Elvira married Isaiah Albert Leirle in 1871 and died in 1930.) Elzira married her sister’s widow on November 12, 1877. They had 3 children. Elzira died prior to August 1889 when Thomas married Mary Etta Davis. However, I can’t find her death or burial information. She doesn’t seem to be buried in Linn Grove cemetery where most of her family, including her parents, sister, and husband, are buried. Thomas died on September 30, 1893. His Find A Grave memorial is here. Benjamin Franklin Perkins – Benjamin was born on March 8, 1858 in Warren County, Iowa. He married Mary Anna Allcock on August 18, 1886 in Warren County, Iowa. They had 3 children. He died in 1927. His Find A Grave memorial is here. Frankie – On the 1880 US Census, an adopted 6 year old son Frankie is listed. He was born in Iowa and his parents were born in Iowa. I have no further record of him. This entry was posted in Perkins Family History and tagged Absalom D Weidner, Adam Huffman Perkins, Benjamin Franklin Perkins, Daniel R Perkins, Daniel Reece Perkins, Edward Perkins, Elvira Perkins Gray, Elzira Perkins Gray, Frankie Perkins, Joseph Hall Lockridge, Martin VanBuren Perkins, Mary Anna Allcock Perkins, Mary Elizabeth Perkins Lockridge, Mary Jane Lockridge Perkins, Rachel Herring Perkins, Rebecca Perkins Wiedmer, Sarah Huffman, Sophia Jane Burkhead Perkins, Thomas J Perkins, Thomas Smith Gray by fillinginthefamilytree.com. Bookmark the permalink.